As these Crisps were rather thick the crunch was dulled somewhat. There was no crispy snap, but instead a hard and rigid crack. As the Crisps crumbled they still maintained a reasonable crunch. 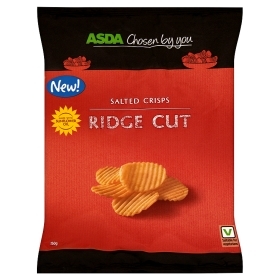 As with most Ridge Cut Crisps, these were thick and meaty with even and fairly narrow crevices The Crisps were a lightish yellow colour, with some brown areas here and there. Most of the bag's constituents were also whole, which is always welcome. There was no notable aroma, but the flavour was a mildly salty potato. The taste was a warm and enriching slightly buttery baked potato, with a smattering of salt.